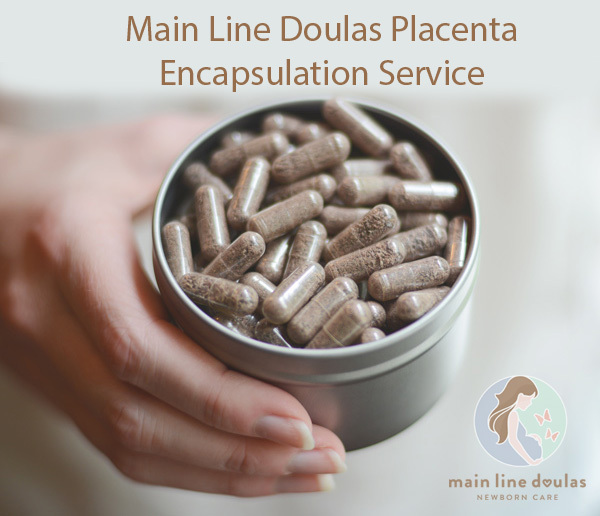 Main Line Doulas provides the safest, quickest and most trustworthy placenta encapsulation services available in Pennsylvania. The cost is $350.00 and can be paid online with a credit card, over the phone or with a check. Women who take placenta capsules report fewer emotional issues and enjoy a faster, more pleasant postpartum recovery. Women, and their families notice a marked improvement in overall feelings of happiness and well-being when taking placenta capsules. Placenta pills are made from your own placenta making it a superb, nutrient rich and completely individualized pill for you Placenta encapsulation turns your placenta taken from your body after your baby is born into about 90-200 tasteless, odorless and very powerful pills. Your placenta is a magnificent potent organ that does amazing things for you and your baby before birth. Now you can extend those tremendous benefits to your body and baby after birth. Experts agree that the placenta retains important hormones. Reintroducing them to your system is believed to ease postpartum hormonal fluctuations. We use age old practices of Traditional Chinese Medicine to prepare your placenta and place it into tasteless, easily swallowed capsules. The placenta is a nutrient transporter; it connects your developing baby to you because it is attached to your uterine wall through the baby's umbilical cord. All of the nutrients and oxygen that the baby thrives on while in your uterus come through the placenta. Human immune antibodies pass through the placenta securing a strong immune system for your baby after birth. The placenta also functions as a highly selective barrier against microbes. It protects you and your baby from foreign invaders that could compromise your health. The wonders of the placenta are not finished with nutrient and oxygen transporter, immune modulator, microbe barrier, but also the placenta secretes essential hormones that are necessary to sustain a healthy pregnancy. It is becoming more and more popular for parents to get their placentas made into pills so that all of the powers of the placenta can be used to support a healthy postpartum period for mom and baby. The benefits to taking your own placenta pills are amazing. Placenta pills can Decrease the incidence of postpartum depression, commonly known as baby blues. Placenta pills can Increase and enrich the quality and quantity of breastmilk. Placenta pills can Increase energy and strength. Placenta pills can Decrease postpartum bleeding. Placenta pills can Decrease iron deficiency. Placenta pills can Decrease insomnia or sleep disorders. Placenta pills can Decreases postpartum "night sweats". The composition of your placenta is completely unique to each and every new mother. No prescription, vitamin or herbal supplement can even begin to do what a placenta pill can. You can take placenta pills with complete confidence that you are doing the best to nourish and nurture yourself and your baby. Pick up the phone now to speak to a Placenta Encapsulation Specialist who will answer all your questions and help you determine if placenta encapsulation is right for your family. 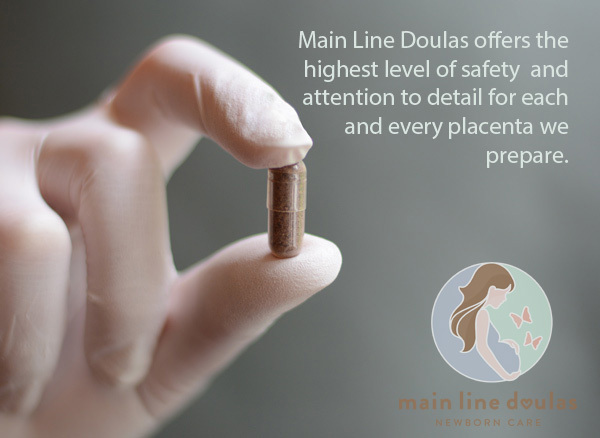 At Main Line Doulas, we adhere to all OSHA & EPA guidelines regarding blood-borne pathogen transmission, infection prevention, standards for sanitation, and safe food handling. All materials used are disposable or thoroughly sterilized between each use and all materials meet food grade standards. PLEASE NOTE: The information on this page has not been evaluated by the Food and Drug Administration. The services offered are not clinical, pharmaceutical, or intended to diagnose or treat any condition.